Saturday, Oct. 1 at 7 a.m.—ADDISON—Those who enjoy wildlife, make plans to attend the 15th annual Dead Creek Wildlife Day in Addison on Saturday, Oct. 1. Activities at Dead Creek Wildlife Day are especially for people who enjoy hunting, fishing, birdwatching, or learning about Vermont’s diverse wildlife. The event will be held at the Vermont Fish & Wildlife Department’s Dead Creek Wildlife Management Area (WMA) on Route 17 west of Route 22A. Early risers can begin the day with bird banding demonstrations at 7 a.m. Two large tents at Dead Creek WMA headquarters will open at 9:30 a.m. featuring wildlife-related exhibits and activities such as decoy carving, building bluebird boxes and wildlife photography. One of the highlights of the festival this year will be a fun and friendly waterfowl calling contest with prizes in honor of the thirtieth anniversary of the Vermont Duck Stamp program. There will also be a presentation on the successes of the duck stamp program by waterfowl biologist David Sausville, who will highlight the nearly 12,000 acres of wetlands conserved in Vermont by funds raised from the sale of the stamp. Nature walks, illustrated talks, live wildlife presentations, hunting dog demonstrations, fishing and hunting tips, and much more will be held until 4 p.m. All events are free, and a free shuttle bus will provide regular access to nearby field events throughout the day. For more information and a schedule of events, visit Vermont Fish & Wildlife’s website (vtfishandwildlife.com) and check under Watch Wildlife. 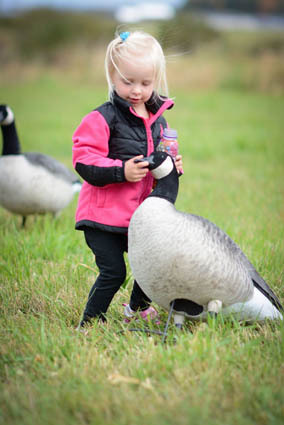 Many of the activities at this year’s Oct. 1 Dead Creek Wildlife Day are tailored to children.